In policy circles in Europe and North America, there’s a lot of pondering about what model may (finally) boost NGA deployment and adoption. The temptation to look abroad is strong, and Australia is often pointed at as an example, but Diffraction Analysis believes that New Zealand is a more interesting and potentially more replicable model. With a strong public commitment as well as a clever mechanism to involve private players, this model looks promising to strongly increase access to highspeed broadband in the mid-term. 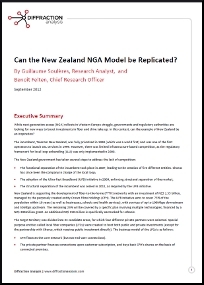 This report analyses the history and mechanisms of the New Zealand NGA model, looks at what might determine its ultimate success or failure and tries to evaluate the regulatory contexts in which a New Zealand style policy approach could work. Overcoming lack of competition in broadband. The threat of the Australian NBN. The financial and political position. Accelerating private investment in fiber networks. Copper to fiber switchover incentives. A parallel plan for rural broadband. IV. Measurable impacts of the UFB initiative. Where else could this work?